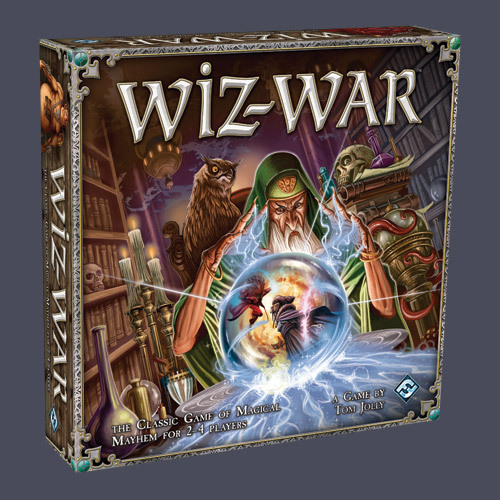 Wizards wage no-spells-barred magical duels deep in an underground labyrinth in Wiz-War. This classic board game of magical mayhem for 2-4 players pits playersâ€™ wizards against each other in a stupendous struggle for magical mastery. Win by stealing other wizardsâ€™ treasures and hauling them back to your base, or just score points by blasting the other wizards. The last wizard standing always wins. Staying true to the spirit of the game that has entertained players for years, as well inspiring an entire genre of games, Wiz-War caters to the imagination and the funny bone. Casting an enriched array of spells, your wizards race through an underground maze, avoiding fireballs, werewolves, and psychic storms. Subtle game enhancements by Kevin Wilson and Tom Jolly promote faster play and clarify card effects. An excellent game. Not only is it beautifully made and re-created in the fashion of the original Wiz-war but it's just fun! I have to say of all the new games this year this one has been the most fun and thus the most played! Can be a real blast...blasting spells all over the place helter skelter, this can be a true game changer from one moment to the next.